The most recent stats on our snowpack here in the upper Yakima River basin put us at 86% of normal. Not great, but not terrible either. As fishing guides we keep an eye on snowpack throughout the winter, because our livelihood, as well as the health of our business partners (the fish) is dependent on having the right levels of water at the right temperature, especially during the summer months. Too little snowpack means we may have an awesome spring season with light runoff, but summer water levels may be low with water temps that are not healthy for cold-water species like trout. The opposite is true in a heavy snowpack year. 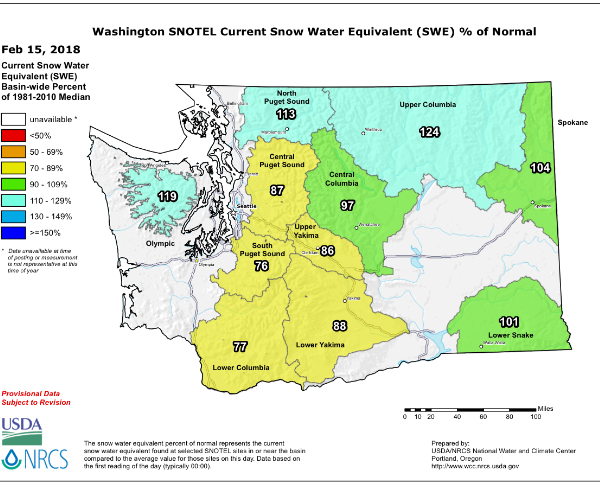 With above average snowpack, we generally see a tough spring season due to prolonged runoff with water levels and temps conducive to fish and fishing throughout the summer and into the fall. Although this scenario can make for challenging early-season conditions, the fish fare much better in a big water year. So what's in store for the 2018 season? Even though we have just a couple weeks left in the month of February, and spring fishing seems like it is just around the corner, there's still ample time for snowfall in the mountains. Late February and March can bring some big storms to the Cascades, and this upcoming weekend Snoqualmie Pass is forecasted to get 14"+. A few big dumps could get things back to normal (100%), so we'll keep doing our snow dances here in the Kittitas Valley, because a snowy March means there will be plenty of healthy, happy trout come August.